Tick these sea stacks off your list! We've picked some of our favourite Orkney sea stacks for you to find during walks on our beautiful coastline. 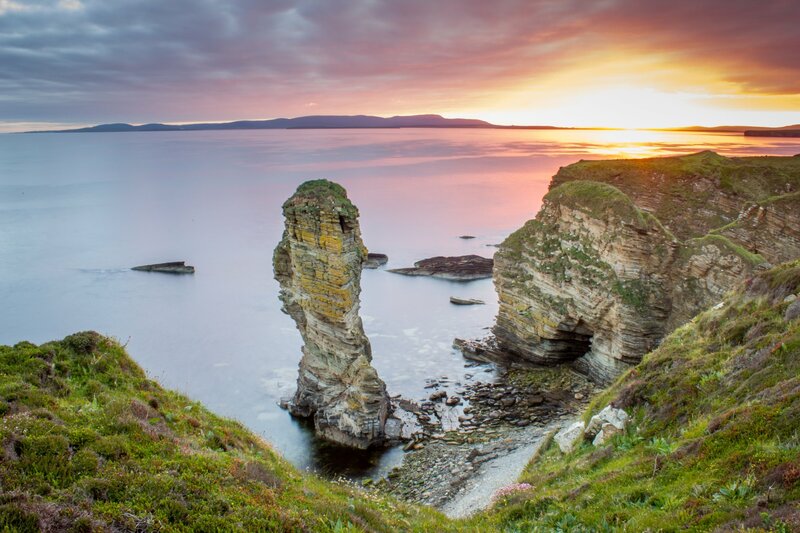 Orkney has around 570 miles of coastline and it’s full of cliffs, caves, beaches and bays. But one of our favourite things about exploring the coast around these islands are the stunning sea stacks you can find just offshore. Some are easy to reach, others require a bit of legwork, but they’re all well worth a visit. We’ve picked five of the finest to be found in Orkney. 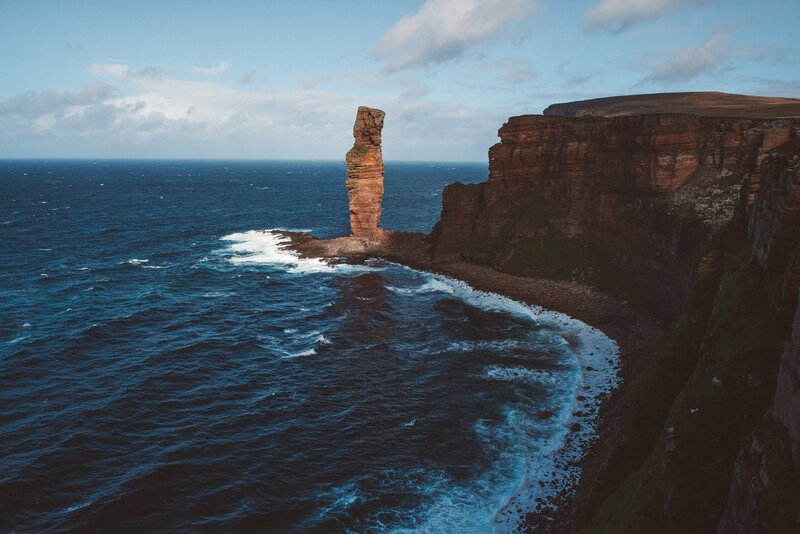 At 115 feet tall, this short, squat sea stack isn’t the largest in Orkney, but it is set in some of the most spectacular coastal scenery to be found in the islands. The two-legged Castle feels like it’s almost within touching reach from the nearest headland, and the surrounding cliffs provide the perfect amphitheatre for viewing. Ok, it isn’t technically a sea stack as it’s still connected to the island of Hoy, but we couldn’t leave this famous Orkney landmark off the list! The Old Man of Hoy is 449 feet of vertical red sandstone that is on the bucket list of most climbers. The walk to the Old Man from Rackwick is beautiful, and the views over the stack from the nearby St John’s Head are even better! Stackabank is the smallest sea stack on our list but it’s still definitely worth a visit. You can find it on part of a stunning coastal trail at the southern end of South Ronaldsay, which takes you past small bays, coves and derelict crofts, with sweeping sea views over Scapa Flow. Now this is life on the edge! The huge cliffs at Costa in the north west mainland are rarely visited, but those that venture to this wild spot are greeted with incredible views. The Standard is a jagged chunk of rock that sits offshore, battered by the Atlantic Ocean, as seabirds swirl all around. What a place! We almost didn’t include this one because, well, it’s our favourite! Keep walking south past Yesnaby Castle and you’ll eventually come to this delicate-looking, dramatic sea stack. Readers of a certain vintage might remember it from an advert in the 1990s when a car was placed on top of it. 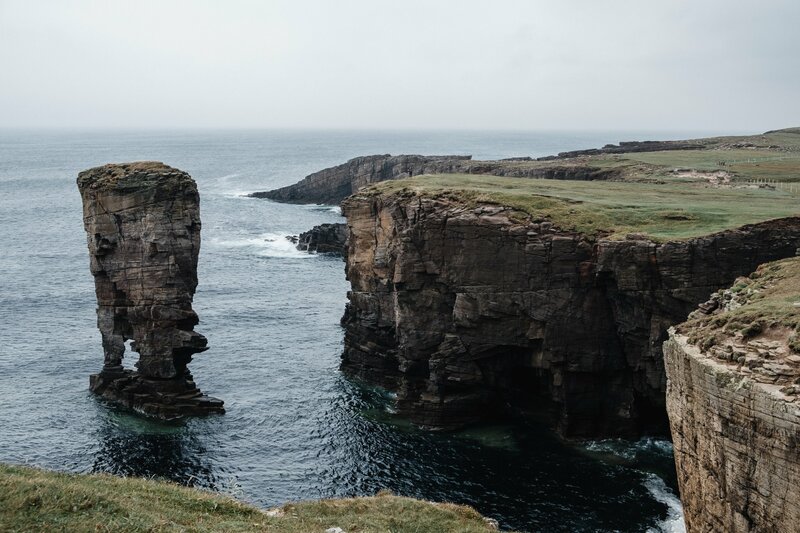 North Gaulton is one of those special Orkney locations that you’ll probably have all to yourself, and the surrounding cliffs provide the ideal viewing point. Come and experience Orkney for yourself – plan your trip and seach for your ideal accommodation via Orkney.com. If you’re visiting these locations or any stretch of coastline around the islands, remember to take care close to cliff edges. The ground can be loose, and wet and windy conditions can be dangerous. Always watch where you’re going and never get too close to the edge. Posted on , Visit Orkney, Nature, West Mainland, by Andrew Learmonth.